Congratulations on taking some steps to make your workplace more sustainable. As mentioned in our previous post, little changes add up over time so your goal of greening up your office should be a journey in progress. Here are some more easy to implement ideas to help your workplace become more eco-minded. Some office buildings have recycling collection services included for their tenants. If yours doesn’t you can ensure that the recyclables in your workplace are given another life simply by putting out a collection bin and either bringing it home to add to your recyclables or dropping it off at a local collection site. Over the last 20 or so years, brewing by the cup has changed how many of us get a great cup o’Joe. While brewing by the cup has benefits (like not brewing an entire pot for just one person and pouring the rest down the drain), the plastic cartridges many are made with cancel them out. Instead, look for a brewer that uses compostable soft pods or grinds the beans fresh for each cup. This way you are reaping the benefits of by-the-cup brewing while not adding to the pile of plastic in our landfills. 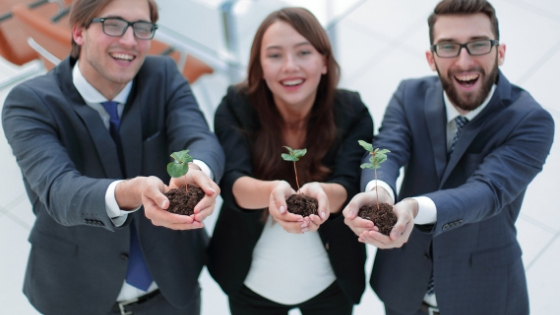 Inspire your employees to get to work in ways that reduce their carbon foot print. Form carpooling groups for employees who live close to one another (which also provides them with additional opportunities to connect about their work projects and personal lives). Create a program that offsets some or all of the cost of a monthly bus passes for those who choose to get to get to the office using public transportation. Install bike racks to give those who put the pedal to the pavement a safe place to lock up their ride. Reward everyone for skipping the drive thru line up with a great cup of coffee worth waiting for when they arrive at the office. Instead of sending the organic waste created at your workplace to a landfill where it will create greenhouse gasses, send it to a compost pile instead. If someone in your workplace has a compost pile at home, just add a collection container to your lunchroom. If you have the space, you may want to consider managing your own compost pile – especially great if you have flower beds or other gardens and put all the compost you create to use growing beautiful things. A third option is to join our Coffee Compost Pick-up Program that diverts all the compostable waste participating customers purchase to a commercial compost facility. When choosing office equipment, look for Energy Star products that use less energy. Turn off computers at the end of the day and use power bars to easily turn off items that don’t need power when you’re not at work. Don’t forget about the coffee brewer! There are models that only heat water when you are ready to brew a pot as well as those that have power saving features that has the brewer automatically go into a sleep mode until someone is ready for another great cup of coffee. If your brewer doesn’t have built in power save features, consider purchasing a programmable timer outlet. Many of these changes are not only good for the environment, they are also great ways to save your employees and company money. When going green saves green, everyone wins. Many of these changes are not only good for the environment, they are also great ways to save your employees and company money.